I enjoy participating in Sketch Challenges, as most of my work is done for me, I just need to find the right stamps and card stock. This week the CuttleBug Challenge Blog has a wonderful sketch that I can see using for many stamp images I own. I decided to use the sketch and create a 4-1/4" x 4-1/2" square card using the Multi Step Baby Set from Kitchen Sink Stamps. I stamped my image as follows (note this is the larger shoe) #3 Going Grey, #4 Going Grey, #2 Going Grey stamped off once, #1 Going Grey stamped off twice. The sentiment is from Kitchen Sink Stamps Words of Comfort & Joy, stamped in Going Grey, using a SAMJ. Don't forget you can save 10% on all you Kitchen Sink Stamps purchased when you use code LISA10KSS at checkout. For the panel behind my stamped image, I ran a piece of Basic Grey Perhaps DSP through my Big Shot, using the Textile CuttleBug Folder, to add a bit more of a distressed look to the panel, I used the CuttleBug Highlight Technique from a past TJNL. This is beautiful Lisa! TFS! Gorgeous indeed!!!! Love the gray & black with the pink.... truly elegant!!! The Cuttlebug Highlight Technique looks like a beautifully aged press tin. Gorgeous!!!! 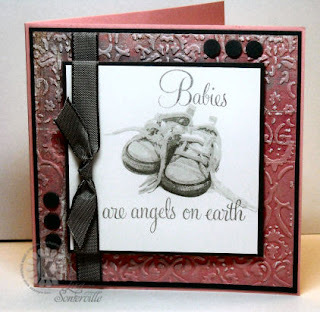 What an elegant baby card! yep - another favorite! i'm a softie for baby cards! love how you turned the sketch --- so perfect! thanks for playing at CBC! i'm so late getting by this week - sorry!